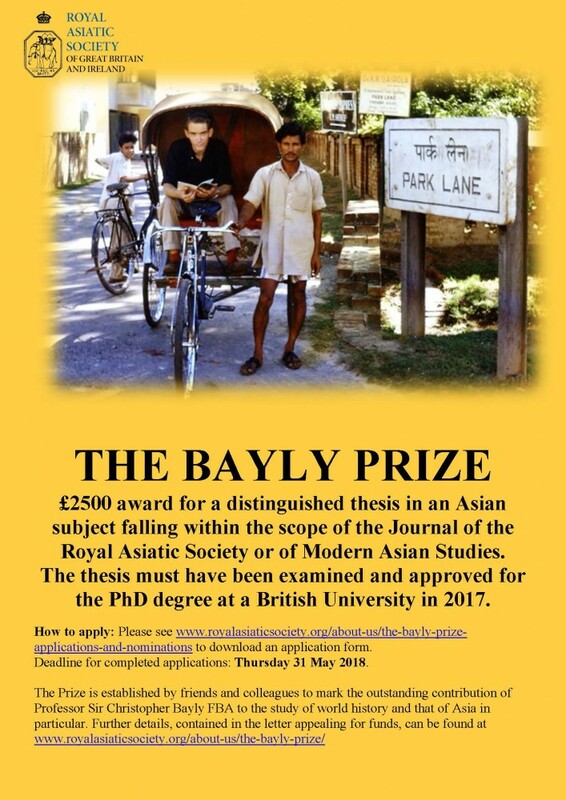 The Royal Asiatic Society is pleased to invite nominations and applications for the inaugural Bayly Prize. The award of £2,500 will be made in 2018 for an outstanding thesis in an Asian subject which falls within the scope of the Journal of the Royal Asiatic Society or of Modern Asian Studies. The thesis must have been examined and approved for the PhD degree at a British University in 2017. Full application details can be found at www.royalasiaticsociety.org/about-us/the-bayly-prize-applications-and-nominations. As the award leaflet writes, the Prize has been established by friends and colleagues to mark the outstanding contribution of Professor Sir Christopher Bayly to the study of world history, and that of Asia in particular. Christopher Bayly was born in Tunbridge Wells, Kent. His father, Roy, was a master mariner and a geography teacher, and Bayly was inspired by his father’s tales of travels and by the intellectual ambition of his mother, Elfreda. He studied European history at Balliol College, Oxford, but a long vacation across land to India in 1965, passing through Turkey, Iran, Afghanistan and Pakistan, sparked his passion for Asia. Under Professor Jack Gallagher, in 1966, Bayly began a thesis on Indian history. Bayly moved to Cambridge in 1969 and held many roles in this time there, including President of St Catharine’s College, Vere Harmsworth Professor of Imperial and Naval History in the Faculty of History, and Director of the Centre for South Asian Studies with which he was associated for over 45 years. Professor Bayly’s publications include Imperial Meridian (1989), Rulers, Townsmen and Bazaars (1983), Empire and Information (1996), and The Birth of the Modern World (2004), all of which challenged current historical orthodoxy and presented new ways of analysing historical contexts. His distinctions were international: he held appointments and received honours in India, Europe, the US and Australia; and at his death he held concurrently professorships at Chicago, Copenhagen and Queen Mary University of London. He was in Chicago when he died in 2015. Such a man and his legacy will hopefully continue to inspire many scholars in the field of history, and in particular Asian history, and it is therefore an honour that the RAS is able to announce the inauguration of the Bayly Prize. Last night, (3rd May) the RAS were pleased to host a lecture by Professor Anthony Stockwell, our current Vice-President (more of that in the next blog). For all Fellows of the Society, please be reminded that the Anniversary General Meeting will be held on Thursday 10 May at 5.30pm. This will be followed, at 6.30pm, by a lecture by Professor Charles Melville who will talk on “The Illustration of Mirkhwand’s Raudat al-safa in RAS Ms. P. 38”. All are welcome to attend the lecture.